Survivor (n.) - To carry on despite hardships or trauma; persevere. In the world of The Walking Dead, there are survivors, and there are Survivors. 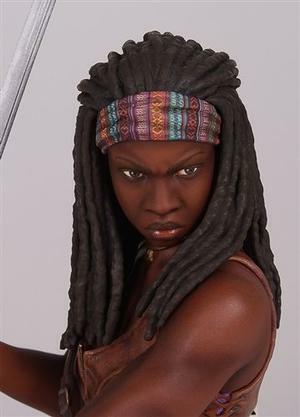 Michonne, a mysterious katana-wielding woman that first appears in the second-season finale, is the latter. A consummate warrior, Michonne has adapted to the new ways of the world, post-apocalypse, and uses them to her advantage. Whether it's using the gore of decimated Walkers to mask her own scent so she can safely walk among them, or using guerilla warfare tactics to bring the battle back to any who dare come after her, Michonne is not to be trifled with. 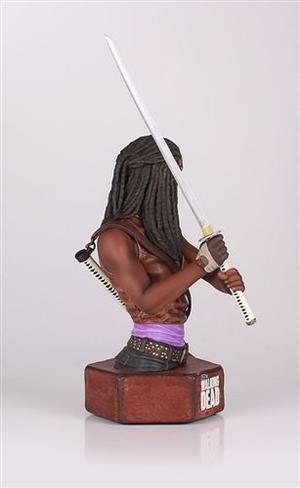 The master artisans at Gentle Giant Ltd. are proud to bring to you the 2013 San Diego Comic Con Exclusive Michonne Mini Bust! 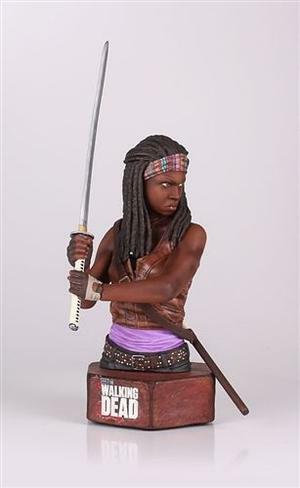 Hand crafted using the original life cast of actress Danai Gurira and resized to 1/6th scale, no other collectable can claim to be as screen-accurate. Cold cast in only the highest quality polystone and featuring a solid metal katana, this hand painted, limited edition bust depicts Michonne ready to take on all comers. Each of these exclusive busts are hand-painted and include a matching certificate of authenticity. This Mini Bust is a Limited Edition Size of 750 Pieces Produced Worldwide.